Happy April! How the heck did it come around so fast? Talent show, theater production, ballet recital, martial arts tournaments, fundraising galas, we are in the thick of it! 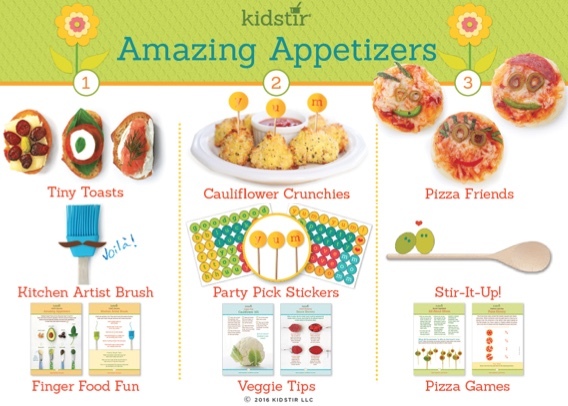 With a social calendar like that, you’re going to love our theme for April’s kids cooking kit: Amazing Appetizers! The small bites you’re going to create are perfect for easy starters, snacks, dinners, and lunches (bento box heaven!) and they’re doubly great for sharing with friends at all your various gatherings. So get ready to razzle dazzle with your amazing appetizers! 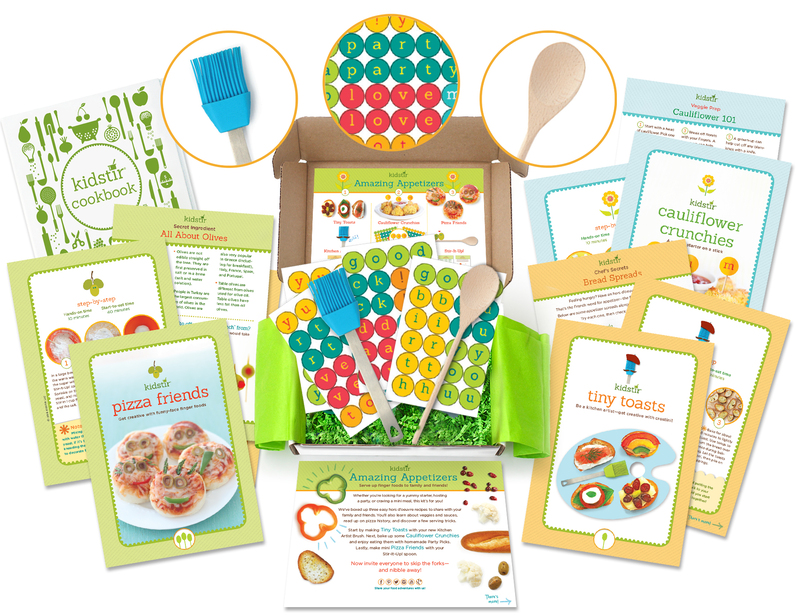 Kick off by reading Mini Meals: Tips for Getting Kids to Make Appetizers, and then, get cooking your mini meals with your mini chefs! Tiny Toasts This is one of my all time favorite recipes from all of our cooking kits. Our versatile recipe teaches your kids how to make and get creative with crostini, “tiny toasts” in Italian. The kids and I made several yummy crostini for their birthday party last year. Then I found myself making them for my own book club gathering last month. And in the summer when it’s hot outside, our family will sometimes make a whole meal out of crostini. I will drink wine, my husband will have a cold beer and the kids will sip on sparking water . We will eat in the patio while watching the sun set, feeling fabulous. This recipe provides so many crostini ideas: kale pancetta, hummus and bell peppers, cream cheese and smoked salmon, mozzarella and tomato, brie and cranberries, I guarantee there will be a perfect match for everyone in your family! Cauliflower Crunchies You know by now that I love vegetables, and I especially like finding creative ways to bring them into our family food plan. Sometimes simple steamed veggies can be just the way to go, but I also enjoy adding a twist to elevate from basic to super. This recipe takes the very healthful cauliflower and perks it up so that’s it’s a truly tasty addition to any appetizer spread. Your little chefs will learn all about panko breadcrumbs and how to use them to jazz up cauliflower. You may already know that panko is a Japanese style breadcrumb that is lower in calories, sodium, and fat and higher in fiber than regular breadcrumbs. And it stays crunchier too, perfect for kid appeal! You’re welcome! This month the tools that come with the Amazing Appetizer kit are not just cute, they’re seriously hard working. I use these tools almost every day, as do my kids! Kitchen Artist Brush I never thought a pastry brush was essential until I got this one. This silicone brush with stainless steel handle is brightly colored and seriously durable. Easy to wash too, just pop off the top and stick in the dishwasher. In this kit your little chefs will use it to brush olive oil onto their Tiny Toasts and Pizza Friends dough. But after this month, you’ll keep on using it to baste a roasting chicken with pan juices, butter the bottom of pans, stir up spices on a plate or in a bowl, paint melted butter on garlic bread, dab after on pie crust to fix and cracks, add melted butter to a waffle iron so the waffles won’t stick, and paint beaten egg on bread dough for a golden brown load. Yes, yes, yes, you’ve got a keeper! Party Picks Only one thing can make little bites even tastier, and that’s eating them off toothpicks! Our Party Picks stickers have tons of letters that kids can attach to toothpicks so their food can “talk”! Yum! Mom! Dad! Happy Birthday to You! Good luck! I Love You! You won’t get enough of these adorable Party Picks. Stir it Up Spoon Classic wooden spoon, let me count the ways I cherish and use you! And now little Kidstir chefs will have their very own long handled spoon to stir with pride. Whether it’s to stir up pizza sauce for Pizza Friends or our yummy Pizza Soup from the Soup’s On kit, there’s no shortage of ways that this item will be put to use. And isn’t there just something so authentic and earthy about using a wooden spoon? I seem to always seem to choose a wooden one over all my other options to give my soups, sauces, and stews a good stir! Besides the delicious recipes, there’s tons of foodie learning in this month’s cooking kit: Chef’s Secrets Bread Spreads (with great learning about hummus, guacamole, tapenade, pesto), Cool Tool tips on all the ways to use your new Kitchen Artist Brush, Veggie Prep Cauliflower 101, Smart Shopping Sauce Secrets (don’t you want to know once and fall the difference between Marinara Sauce, Tomato Sauce, Tomato Paste and Diced Tomatoes? ), Secret ingredient All About Olives, Kitchen Learning Pizza History and Math, and the essential How to Knead visual tutorial. Check it out and you might learn a thing or two along with your kids! Don’t forget to check out more fabulous appetizer recipes on our DIY page. Our Tasty Cheese Tray is perfect for a special event, easy everyday Cheese Straws are great for weekday evenings, yummy Sesame Meatballs are super versatile and homemade Happy Hummus is a winner for health and show! Whether you’re looking for a yummy starter, hosting a party, or craving a mini meal, this kit’s for you. So invite everyone to skip the forks— and nibble away! Share your fun times, tips and tricks, and learnings with us on Facebook, Instagram, Pinterest, and Twitter. We love seeing your kids succeed!